Smart Apartments need smart connectivity options. Our Homebase WiFi network powers all your smart building devices while providing your residents and staff with simple internet service as an amenity. Learn how connecting your community can make you more money per unit. In the age of IoT, cord-cutting, and nearly ubiquitous connectivity, isn’t strange that wifi doesn’t just work? The internet has had a dramatic impact on our daily lives. How we connect to it continues to evolve, but one things for certain, a reliable connection is a must have for any savvy resident. A reliable internet connection can even replace the need for cable TV. High density buildings are problem areas for IT managers because of multiple routers and devices per resident. The increasing number of devices needed to operate a building will only make this network congestion worse. A well-designed private network manages congested networks giving residents and staff a reliable connected experience. We don’t know what the future holds, but we’d bet it involves connecting something in your building to the internet. Having a private network that is built into your building, scalable, affordable, and flexible enough to keep up is critical in future proofing your building for your residents and the IoT. The same network that connects your IoT can also connect your residents. Homebase WIFI as an amenity offers a tiered subscription internet service for your residents with zero hassle for your managers. Offer a little bandwidth or a LOT, it’s your network after all! Start with a free WIFI access tier for connectivity for all and allow your residents to upgrade their unit network to a higher speed instantly and have their subscription added to their rent balance automatically. If you want a smart building, you’re going to need internet infrastructure anyway. 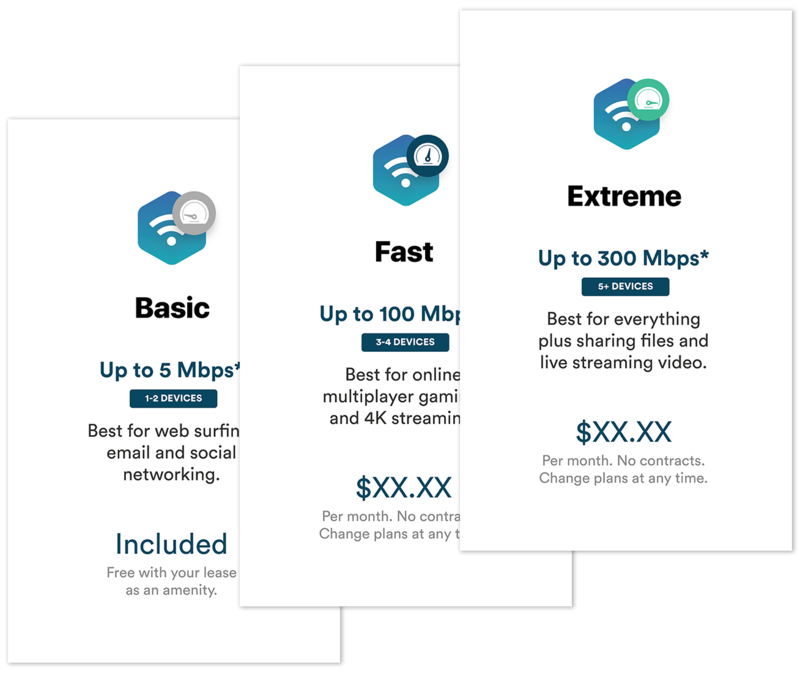 Instead of having this service outsourced to cable providers or 100’s of cellular gateways, own your own private network for your building and provide this service to your residents and tenants for small monthly fees. Build FREE Wifi access into your rent as an amenity to attract tenants. Let residents upgrade to higher internet subscription speeds via the Homebase app and add the fee to their rent. Give residents the perk of signing up for internet right when they move in, not having to wait around for the cable guy is a valuable amenity. Time is money. With your building fully connected, never have to worry about how you’ll connect future IoT devices that could save you money in the future. Quit relying on costly cellular networks– or worse, your resident’s wifi network– to connect the devices you install in your building. Your private network means your devices are always in your control. Setup secure private networks for staff connectivity, retail tenants and other special needs throughout the building. Homebase manages your buildings networks 24/7 ensuring uptime for your devices and your residents. Available for Residents, Tenants, Guests and Staff. Whether it’s a network for your maintenance staff to be connected property wide or access to an open community network in a common area, Homebase has you covered. Setup secure private networks for all the users of the building. How do my residents watch TV? In today’s age of cord cutting, there are more options than ever for over-the-top programming (OTT) for live TV. Services like Hulu, YoutubeTV, Sling and DirectTV now offer live TV over the internet. Homebase works with you and your residents to ensure they know they have many options. What happens if internet goes down? Homebase is a fully managed service provider for IoT and Wifi networks. We monitor your networks 24/7 from our network operations center and will let you know if we detect an outage. If it’s an issue with the ISP, we’ll work with them to ensure service is restored. If it’s an issue with the network, we’ll send a crew out ASAP to ensure your systems are back up and running in no time. Can you retrofit a current building with WIFI? Retrofits might sound complex, but Homebase has you covered. Our trained IT and construction professionals know how to design a network for maximum connectivity and reliability with little disruption to your residents. Who handles resident tech questions? We’ve got this one too. Residents can chat directly with a Homebase customer success agent from the Homebase app. We’ll take the burden off your staff of making sure everyone’s connected properly. How fast is the resident internet? This is market dependent but typically we see our clients offer internet download speed tiers of 5MB up to 300MB. How much does this cost a month? A couple factors go into the cost of a managed Wifi network including building size, layout and geographical market. Our expert team works to value engineer your network and find the right carrier for maximum reliability and cost effectiveness. Homebase is happy to provide a FREE ESTIMATE, just provide us your building details. Send us your building details for a free estimate. Chat with a Homebase Customer Success Representative today to see how easy it is to upgrade your properties for the future.